I’m super excited about this latest recipe for gluten-free Fresh Berry Cake. 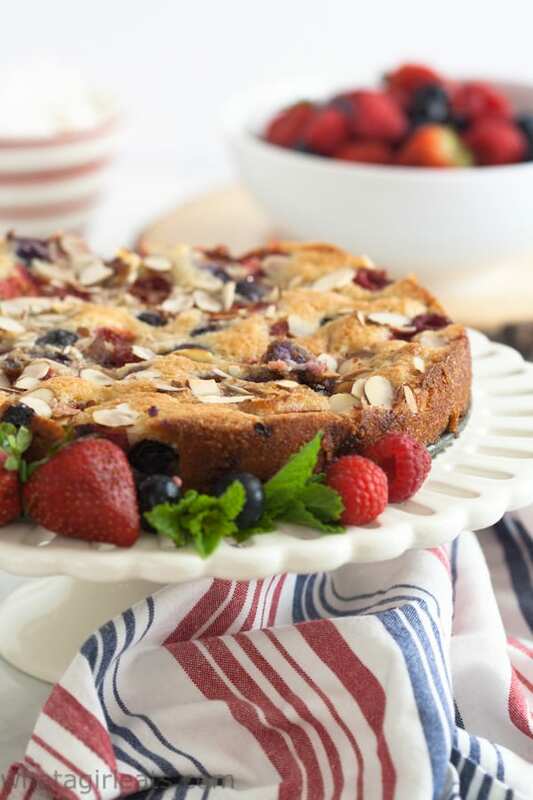 This grain-free Fresh Berry Cake is packed with flavor, with a minimal amount of sugar. 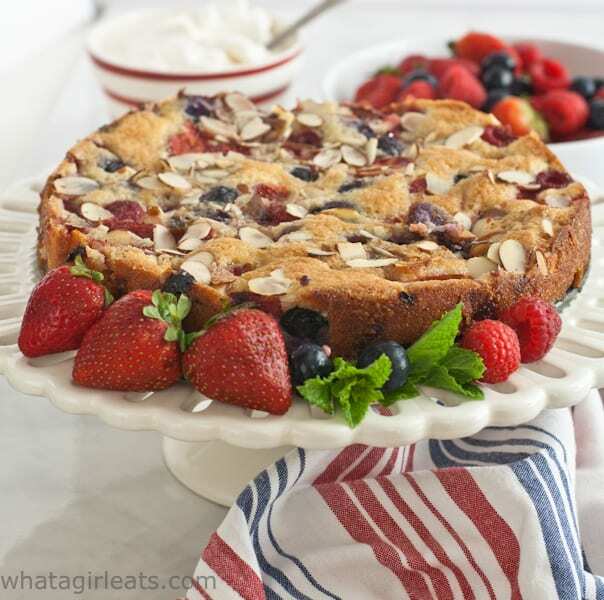 Serve it with fresh whipped cream and more berries! No one in our family has a huge sweet tooth, so I make very few desserts. When I do, I look for low-sugar, fruit based desserts, like this Eton Mess, Mango Sherbet, or Poires Belle Helene, all of which are not only low in sugar, but naturally gluten and grain-free. This post may contain affiliate links for your convenience. 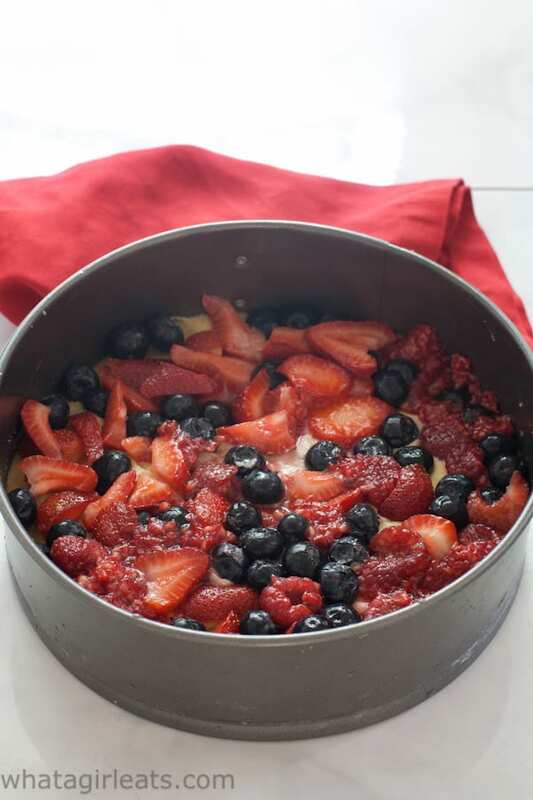 I stumbled across this recipe fresh berry cake on the King Arthur Flour website and immediately thought it would adapt perfectly with almond flour. With just 3/4 a cup of sugar for the entire cake, presto!…Grain and Gluten-Free Fresh Berry Cake! 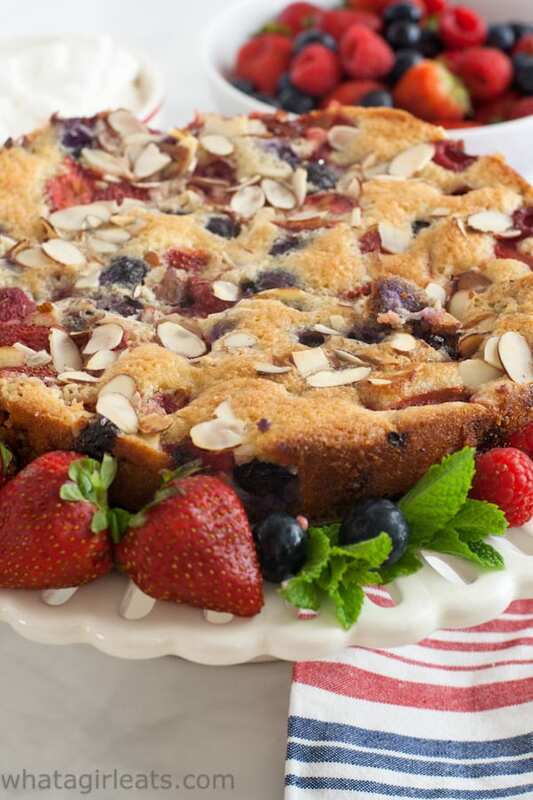 This Gluten-free Fresh Berry Cake is a party hit! I brought my adapted version to a BBQ last weekend, and it was gone in a flash. A couple of the men who were there were shocked that it was “gluten free”, one of whom had recently given up all gluten in an attempt to help with his arthritis. 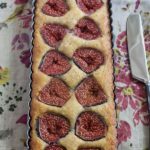 Because almond flour is naturally moister than wheat flour, this cake/torte is not light and fluffy, but rather similar to a Clafoutis. Cool this cake thoroughly before attempting to slice it, or serve it warm, but it will be a bit softer. Spread batter into a well-greased springform pan. 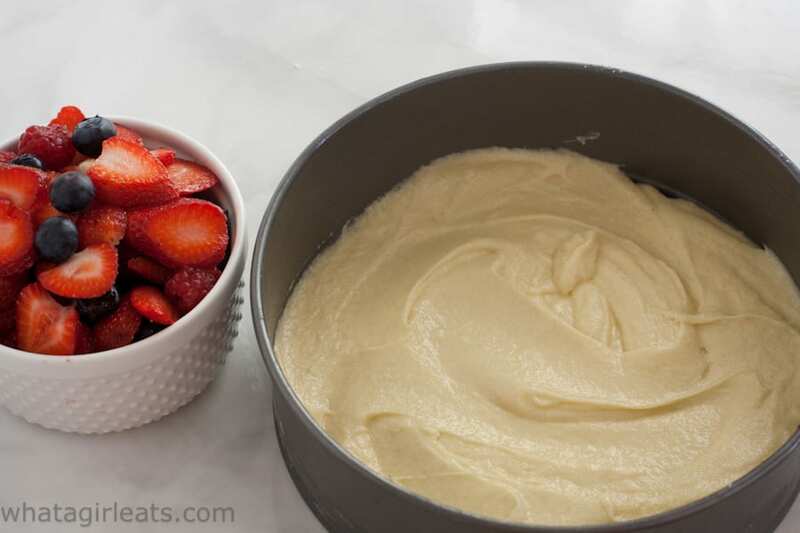 Cover batter with fresh berries. …sliced almonds and a little more sugar. Top with sliced almonds and sugar. Serve with lightly sweetened fresh whipped cream and extra berries if desired. 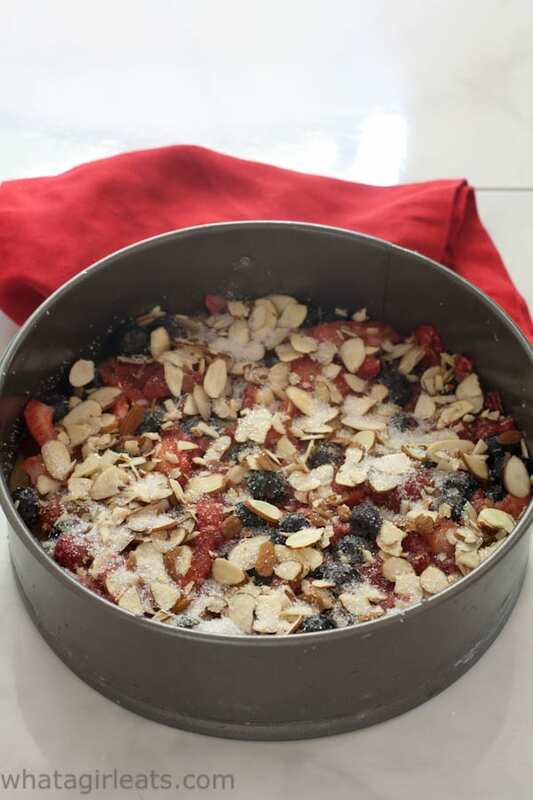 Adapted from King Arthur Flour's Late Summer Berry Torte, this gluten free and grain-free version is loaded with fresh berries and a hint of almond. 1 1/3 cup 3 1/4 ounces almond flour, sift before measuring to remove any clumps. Pre-heat oven to 350 degrees F. Lightly grease an 8" or 9" square or springform pan. Beat together softened butter, 3/4 cup sugar, baking powder, and salt until smooth. Add eggs, one at a time, until thoroughly combined. Add vanilla and almond extracts. 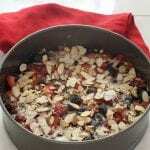 Top with berries and sliced almonds. Sprinkle with 2 Tablespoons sugar. Bake at 350 degrees F. for 40-45 minutes, or until toothpick comes out clean. (The center will be somewhat moist). Fresh Berry Cake is grain and gluten free! This is also a great way to use up fruit that’s a little past its prime. I use whole raspberries and blueberries, and slice the strawberries. Blackberries would also work well. Not an almond fan? 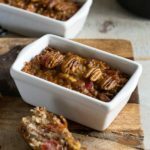 Substitute the almonds for chopped walnuts or pecans and omit the almond extract. I hope you enjoy this Grain-Free Fresh Berry Cake as much as we do! Fresh Berry Cake is gluten and grain free! I love berry cakes! Especially with the almond infused flavor too! Wow. I love everything about this cake. The berries baked on the top are so pretty! Thank you Raia! Me too! 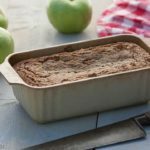 Almond flour is such a great swap in most baked goods! This berry cake is beautiful! LOVE all of that fruit, my kiddos would love this. Such a fun and festive cake for this time of the year too. Thank you Emily! It’s a nice, fairly healthy dessert! Great summer cake for so many occasions! Perfect for picnics, too! Love any kind of cake if berries are involved. It would make an awesome addition to casual brunch or even afternoon tea. yes, it would. It would be nice for a brunch! I made this for Easter and it was FABULOUS!!! Isn’t it good? Even my non-gf friends request this! I’m confused by the amounts listed for the almond flour. Is it 1 1/3 cup or do you recommend weighing it? According to charts 1 1/3 Cups would be 4.52 oz. so I’m not sure how much to use? Weighing it is always best. This is a good example. I sifted my almond flour before measuring it, then weighed it to give both measurements. But since almond flour sometimes clumps up (more than regular flour), it can be denser and weigh more. I amend to add the words “sifted” as unsifted almond flour is bound to weigh more. Hope that helps. I’d like to substitute coconut flour for the almond flour do you know the conversion and how many more eggs would I need to add? Coconut flour is not really the same as almond flour. It absorbs much more liquid, so you’d have to use less coconut flour than almond flour and probably add more liquid. I’ve never tried it with just coconut flour.